Studio Number One (SNO) was founded on the belief that art does not just belong in museums and galleries, it should also be an integral part of the visual landscape. SNO creates bold, graphic media that stands out amid the urban clutter, beautifying the environment while stimulating the public with innovative design solutions. Guess who this is? 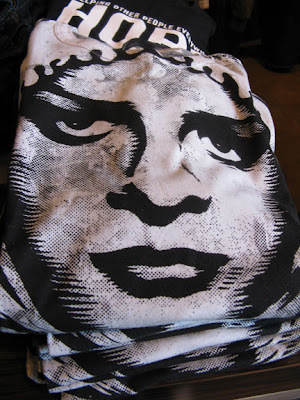 Shepard Fairey! 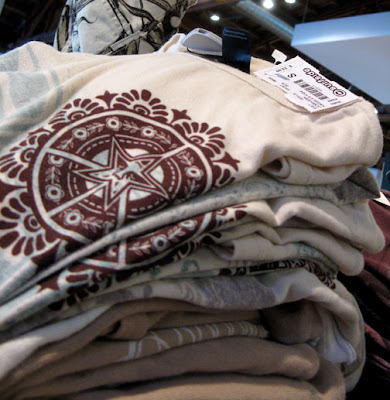 In my quest to wrap my head around what he is about--with the prompt from the Obey line of clothing (how is that managed? how does he justify (or does he need to? 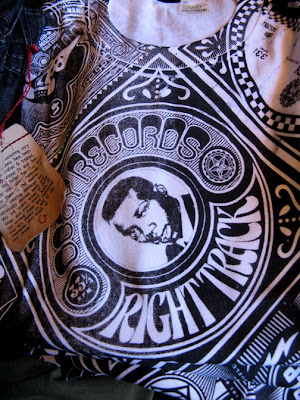 the porting of his art images to teeshirts and hoodies? Is it another licensing deal like Ed Hardy?).. His work in the stores reflect his print work with new shapes (probably not Fairey) but using his posters to promote his image and personal brand (framed in the store). In the hopping around, I found this critique of Fairey's work by Mark Vallen (sounds a bit like jealousy) which is interesting in his messaging...so if that is the case--now the plagarist is being plagarized by Obey the Purebreed etc. There is nothing new about using old images as reference. 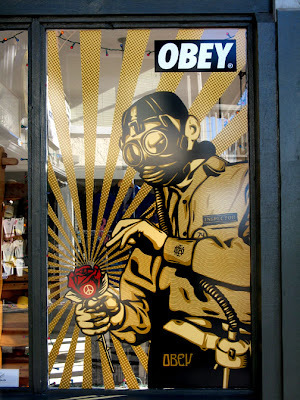 Perhaps Shepard Fairey is a little close in with regard to how he uses those images, but somehow I think this helps in keeping his work as concentrated and good as it is. He could afford to tweak it a little further than he does (particularly in the nuclear image) in the layout--but overall, Fairey is taking the old image to a new place of his own propaganda. 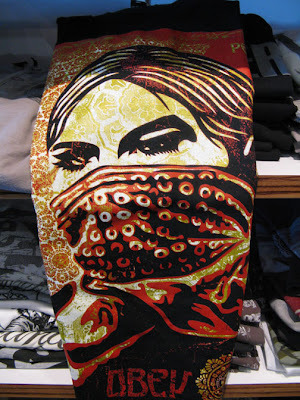 "Subliminal Projects was created by artists Shepard Fairey and Blaze Blouin in 1995 as an artist collective, using skateboards as a fine art medium. By expanding beyond skateboards and apparel to include fine art prints, the group began drawing the attention of Aaron Rose, curator of Alleged Gallery in Ney York. As a result, Subliminal is one of the key groups responsible for cementing the relationship between the skateboard culture with the fine art world, working with the then-unknown artists such as Phil Frost, Thomas Campbell, Mike Mills, Dave Aaron, Shelter Serra and Mark Gonzales. By reintroducing Subliminal Projects to the current art scene, Shepard and Amanda Fairey continue to promote collaborations in the form of publications, art shows and events between artists of varying disciplines." Look for his skateboards. They are great. I love the portraits and the vector-y swatches and flourishes. They are regal and very offical looking--with images of these guys with their baseball caps put on backwards. I initially thought they were dead gang members until I read who they were. There is that aura around them. Juxtapoz has a great article on Fairey in their November 2007 issue.